Our medium jute mini bag is ideal for cosmetics & personal products, although we can think of many more uses for it like arts & crafts. Both cute & adorable - with a wide selection of colours to choose from - we are convinced your customers will love our jute mini bags too! 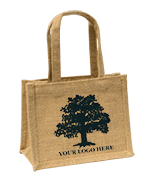 "We had to write to tell you how delighted we are with our mini jute bags. We ordered them on Wednesday and received them the next day now, that's what we call service! We will certainly be ordering from you again and would have no hesitation in recomending you to our friends and customers." Have just re-ordered as the small window bags have been a great hit with the Country Market customers. Perfect for our jams, etc and the colours complement the produce very well.